Ehsani, M., Sepehri, M. (2014). Balanced clusters and diffusion process in signed networks. Journal of Industrial and Systems Engineering, 7(1), 104-117. Maryam Ehsani; Mohammad Mehdi Sepehri. "Balanced clusters and diffusion process in signed networks". 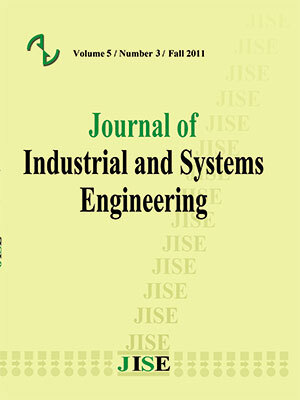 Journal of Industrial and Systems Engineering, 7, 1, 2014, 104-117. Ehsani, M., Sepehri, M. (2014). 'Balanced clusters and diffusion process in signed networks', Journal of Industrial and Systems Engineering, 7(1), pp. 104-117. Ehsani, M., Sepehri, M. Balanced clusters and diffusion process in signed networks. Journal of Industrial and Systems Engineering, 2014; 7(1): 104-117. In this paper we study the topology effects on diffusion process in signed networks. Considering a simple threshold model for diffusion process, it is extended to signed networks and some appropriate definitions are proposed. This model is a basic model that could be extended and applied in analyzing dynamics of many real phenomena such as opinion forming or innovation diffusion in social networks. Studying the model declares that highly balanced dense clusters act as obstacles to diffusion process. This fact is verified by numerical simulations and it is declared that balanced dense clusters limit perturbation diffusion and the rest time. In other words the systems with more compatible communities and balanced clusters act more robust against perturbations. Moreover, the final state majority would be the same of more balanced cluster initially. These structural properties could be useful in analyzing and controlling diffusion process in systems. networks. The American Naturalist, 180(2), 186-199. Mechanics and its Applications, 390(21), 3876-3887. Cartwright, D., & Harary, F. (1956). Structural balance: a generalization of Heider's theory. heterogeneous consumers. Computational and Mathematical Organization Theory, 13(2), 185-202.
connected world. Cambridge University Press. J.A. Davis, Clustering and structural balance in graphs, Human Relations 20 (1967) 181–187. Lyst, J. A. H. O., Kacperski, K., & Schweitzer, F. (2002). Social impact models of opinion dynamics. Annual reviews of computational physics, 9, 253-273.
seeding for information cascades in cellular networks. In INFOCOM, 2012 Proceedings IEEE (pp. Languages and Programming (pp. 530-542). Springer Berlin Heidelberg. Information Diffusion. Physical review letters, 113(8), 088701.
of voter model dynamics using biased nodes. In American Control Conference (ACC), 2014 (pp.